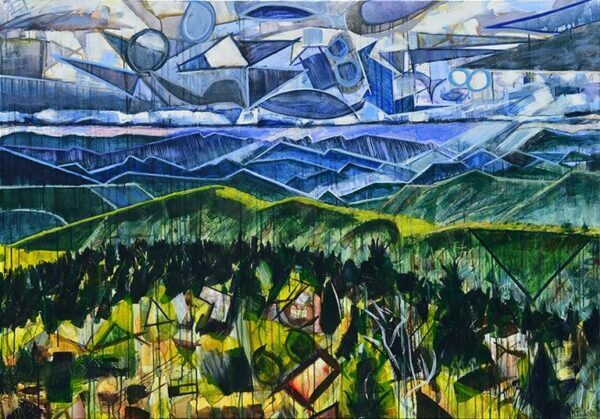 My Heart is a Blue Ridge Mountain is an abstract landscape painting of the Appalachian Mountains in spring or summer by Boone, NC artist Kent Paulette. 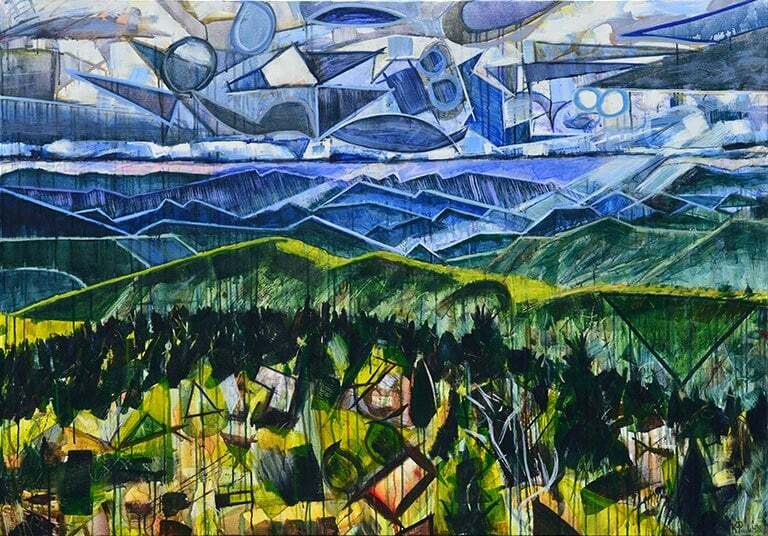 The trees and hills in the foreground of this Blue Ridge Parkway painting are green. The sky is blue with clouds and rays of sunlight. Buy this modern art in small & large sizes on canvas. This mountain painting is made of colorful geometric shapes that look like stained glass and Cubism. The dynamic brushstrokes give this fine art a sense of movement and a bold energy. The vibrant colors further bring the contemporary landscape to life. High Country artist Kent Paulette painted this beautiful scene from nature which is located near Grandfather Mountain in June 2016. He added natural elements from the Blue Ridge Mountains of North Carolina where he lives when he painted this view of the outdoors. Some shapes are angular and some are curvy which give this contemporary painting an organic, expressive feel. The forest in this mountain range is peaceful and bright, yet there is also a lot of motion in the landscape.